From the get go, all of us here at Crutchfield were instant fans of the AudioQuest DragonFly USB DAC, and the way it improved the sound of our computer music. But a lot of us wished it could work with our smartphones and tablets, too. Well, we got our wish. The DragonFly Black now delivers that same clear, dynamic sound with Apple or Android mobile devices. The design gurus at AudioQuest not only gave the Black a far more energy-efficient design — ideal for portable use — but they even managed to enhance its performance. The DragonFly Black's low power consumption makes it a perfect companion for your smartphone or tablet. 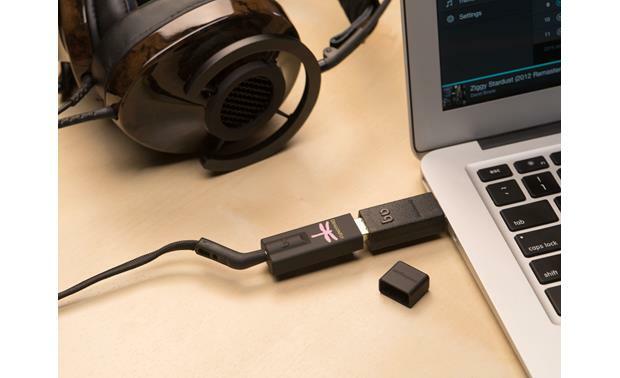 The first thing that AudioQuest did was to give the Black a new high-performance USB microcontroller with greatly reduced power consumption (77% less, to be exact) for true compatibility with mobile devices. The new chip also provides an improved signal-to-noise ratio for quieter operation and cleaner sound. Plus, it enables future software upgrades through AudioQuest's free desktop application. AudioQuest also replaced the DragonFly's original DAC chip with an improved 32-bit ESS Sabre 9010 processor. This high-performance DAC features minimum-phase filtering for exceptionally detailed, dynamic, and natural sound. The Dragonfly Black delivers enough power to easily drive earbuds and efficient portable headphones, as well as the preamp inputs of a receiver or powered speakers. And although it's operated digitally from your computer screen or mobile device's interface, the DragonFly's precise, 64-step analog volume control avoids any reduction in resolution or sound quality that can plague many digital volume controls. 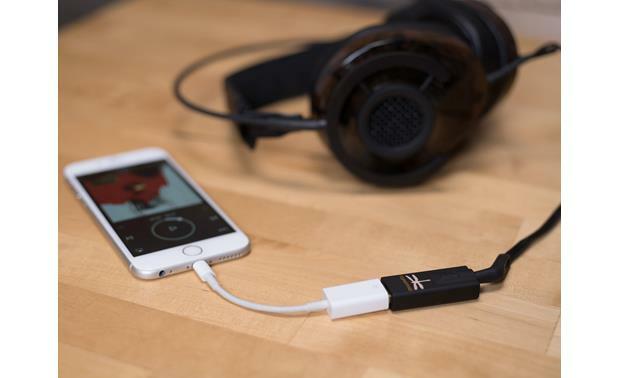 Plug your headphones directly into the DragonFly's stereo mini audio output jack for high-energy private listening. You can also use an optional stereo mini-to-mini cable or mini-to-RCA adapter to feed a line-level signal to a pair of powered speakers, power amplifier, or receiver for more robust, room-filling sound. This little thing works fantastic. I plugged my new dragonfly into my laptop there was an immediate and radical improvement in the sound. Can I plug this into my car's usb port then plug my iPhone into it for better sound in my car? I have not tried that myself it probably will not work because the USB side is the source of the music. USB DAC + Preamp + Headphone Amp: The AudioQuest DragonFly Black is a sleek, flash-drive sized USB DAC+Preamp+Headphone Amp that delivers far superior sound by bypassing the poor quality sound card that is built into your Apple iOS and Android smartphone/tablet or Windows and Mac laptop/desktop computer; turning your device into a true high-fidelity music source. Its 3.5mm port is designed specifically to connect to an external audio system such as headphones, powered desktop speakers, or your HiFi audio system. Android Compatibility: Compatible with most Android devices running Jelly Bean 4.1 or newer using the DragonTail USB adapter (703DTAILAN, sold separately). If the DragonFly Black seems to have too little output, then download the the USB Audio Player Prop app which includes its own USB audio driver. This application is compatible with various audio formats and will manage music on both the Android's internal memory and inserted microSD card. Additionally, with your Android phone connected to a WiFi network, this app can find and connect to DLNA servers/libraries, plus support playback of Tidal (UAPP does not offer support for any other 3rd-party applications). 32-Bit ESS Sabre 9010 DAC: At the heart of DragonFly Black is a 32-bit ESS Sabre 9010 DAC that uses a sophisticated minimum-phase digital filter to provide more naturally detailed and dynamic music. 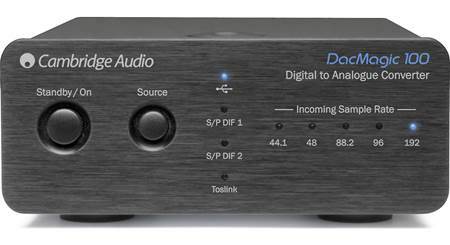 This high-performance DAC is typically found in today's higher-end CD and Blu-ray players. 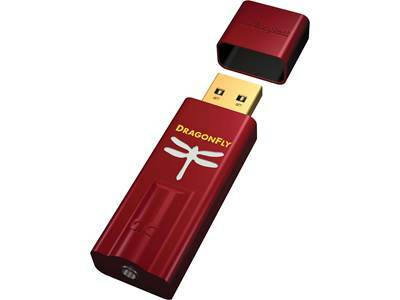 DragonFly Black can accept audio and music files ranging from MP3s (128/256/320kbps) and CD-standard 16-bit/44kHz to native 24-bit/96kHz high-resolution, regardless of music file format. DragonFly Black will accept almost any audio you want to play on your computer and make it sound dramatically better, whether your listening pleasure is iTunes or streaming music services such as Pandora, Spotify, Amazon, or Tidal. Streamlength Asynchronous USB: Timing errors such as "jitter" have long been the plague of digital audio playback; never more so than in recent years as computers, laptops, tablets, and smartphones have been pressed into service as audio source components. 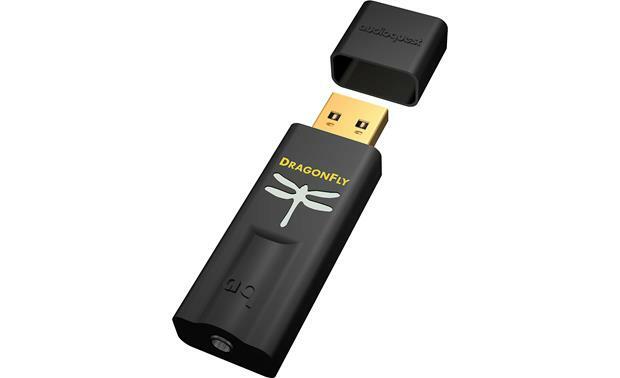 Rather than sharing crucial audio "data clocking" functions with your source device, DragonFly Black uses a very sophisticated Streamlength Asynchronous USB audio data transfer protocol which takes command over the timing of the audio data transfer, dramatically reducing digital timing errors. As a result, you get low jitter, low resource load, minimal packet errors, world-class audio playback, and reliable connectivity between the USB DAC+Preamp+Headphone Amp and your smartphone, tablet, laptop, or desktop computer. Hybrid-PLL Clock System: The DragonFly Black employs a unique clock system called a Hybrid-PLL. While not discrete, the Hybrid-PLL performs equal to, or better than, many discrete clock systems. 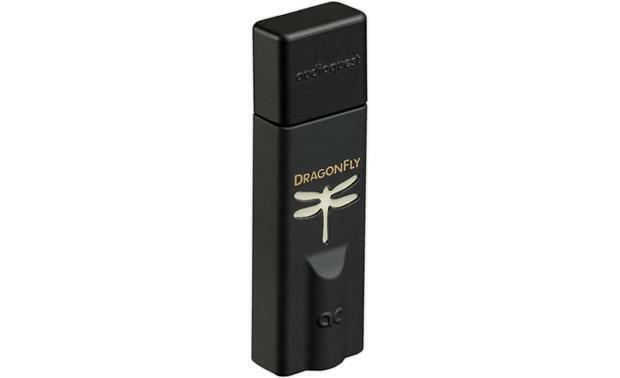 Compatible Sampling Frequencies: DragonFly Black will play music or audio data at 44.1kHz, 48kHz, 88.2kHz, or 96kHz. However, for the best sonic results your smartphone, tablet, laptop, or desktop computer should be configured so that it sends music and audio data to DragonFly Black that matches the "native rate" of the music. For example, since all CDs and music files purchased from iTunes are at a 44.1kHz sample rate, for many people 44.1kHz will be the best sample rate since this is the "native rate" of most digital music. Choosing a higher sample rate will convert your native music and audio data using mathematical approximations that can potentially decrease the sound quality. Conversely, if you have purchased high-resolution music files (96kHz), such as those available from HDtracks.com, configuring your computer for 44.1kHz (or any other lower sample rate) will cause the computer to down-sample your music to a lower resolution. When possible, always configure the computer to output the native sample rate of the music you are listening to. Note: If you have purchased a file that has a higher sample rate than 96kHz you need to configure your smartphone/tablet or computer/laptop to send DragonFly Black audio data at a resolution no greater than 96kHz, and for the best performance the sample rate you choose should be exactly half the sample rate of the file you're playing. For example; if you purchased a 24-bit/176.4kHz file, 88.2kHz should be selected, whereas if you purchased a 24/192kHz file, 96kHz should be selected. Directly divisible sample rates prevent the computer from doing sonically degrading, complex math in its conversions and allows DragonFly Black to sound its best. MQA Firmware Update: The latest firmware update (1.06) will provide the DragonFly Black with the capability of rendering Master Quality Authenticated (MQA) files. This means that now the DragonFly Black lets you experience your favorite albums and songs in the highest audio resolutions available. As an MQA-rendering DAC, the DragonFly Black must be used with an MQA-approved playback application, such as Tidal or Audirvana (with more to come), in order to unlock the full resolution of an MQA file. Note: When rendering MQA files, the DragonFly Black will display a purple light. (Sampling rates of 96kHz will continue to display in magenta.) While the DragonFly Black will not specify the native resolution of the associated MQA file, you can rest assured that the MQA file was derived from the highest source resolution available. Direct Coupled Analog Circuits: DragonFly Black's analog circuits are direct-coupled from the ESS converter chip's output, avoiding the need for any extraneous, sonically degrading components in the signal path. Stereo Minijack Output (1.2-Volt): DragonFly Black is fitted with a stereo female minijack (3.5mm) output and will output 1.2-volts, which is enough power to successfully drive most preamplifier input circuits and a wide range of today's medium-to-moderately efficient headphones. 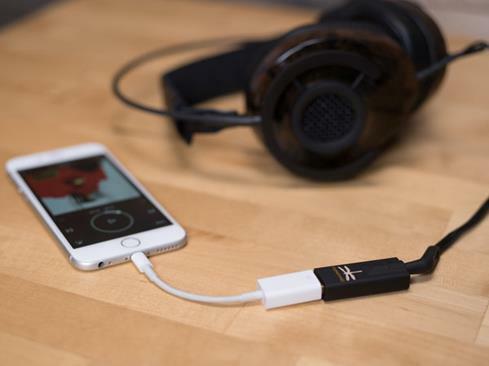 The DragonFly Black's 3.5mm output can be used as a Headphone Jack, a Variable Out, or a Fixed Output. Headphone Out: DragonFly Black is versatile enough to drive virtually any headphone on the market today. DragonFly Black can drive any headphone from 12-ohm impedance on up. DragonFly Black has enough output to drive even the lowest efficiency headphones. Variable Out: DragonFly Black can be used in "variable" output mode with computer-controlled analog volume control when connected directly to powered speakers or a power amplifier. Fixed Out: Connecting to a traditional preamplifier or AV receiver, DragonFly Black can be set to a "fixed" output mode by turning the volume to maximum, allowing it to behave like a CD or Blu-ray player. LED Indicator: A smart LED indicator behind the DragonFly Black icon shows the resolution of the incoming signal - 44.1kHz (green), 48kHz (blue), 88.2kHz (amber), and 96kHz (magenta). Red indicates standby mode. Firmware Software Upgrades: The DragonFly Black is firmware/software upgradeable through a complimentary Windows PC or Mac OS X desktop application. As new developments arise in music player applications, streaming protocols, or other associated software; DragonFly Black users will be able to incorporate those updates to their existing devices. No. This device is "output" only. Not entirely sure because I THINK that the USB end is to input the sound and the 3.5mm jack is the output. That said you might be able to use the Dragontail device for iPhone to connect your iPhone to this device and then another 3.5mm cable (with the appropriate end) to connect to the car. No, the setup you're describing won't work. The car's USB port is looking for a file system on a USB stick, from which to ingest music files to play; or, for an MTP (Music Transfer Protocol) device, such as an Android phone; or, for an Apple device, such as iPhone or iPod. The Dragonfly is a USB sound card, and it expects to be treated as an audio device, with a digital audio bitstream sent to it (and not pulled from it). This makes it incompatible with your car's USB port. Additionally, it only outputs analog audio; it won't ingest analog audio output from your iPhone. However! If you get an adapter cable to adapt your iPhone's connector to a female USB A connector, you can then plug the Dragonfly into your phone, and connect the Dragonfly's analog audio output to the aux input in your car (if it has one). This approach has a couple of drawbacks: Faster battery drain on your phone, since it will be powering the Dragonfly, and you won't be able to control your phone via the steering wheel audio controls (for track skip, etc.) You'd likely get the best audio quality by plugging your iPhone directly into the USB port, which allows the audio files to remain in the digital domain until they reach your stereo; this also allows you to use your steering wheel-mounted audio controls. The DragonFly has 2 connections. A USB which is an input connection and a phone jack which is an output connection. If your car system has a phone jack input you could use the DragonFly on your iPhone to source your car system. Has anyone used this to send computer audio via usb to a full size amplifier or receiver using a 3.5mm to RCA cable? Are you happy with the results? Thanks. I get the same result when listening through Bluetooth. Where this device is good is listening to songs through your computer. But to me it seems that is just bumps up the volume compared to no device. I tried to get the adapter for this so I could connect my phone to it but have been unsuccessful so far. All-in-all, if you use your headphone alot then go for it. Otherwise, save your money. Well not exactly to a super hi end system but I have plugged it into a number of car systems as well as some of the nicer portable speakers (Kef Muo, B&W T7 etc...) plugged into the iPhone 7 via the USB 3 camera connection kit and an Audioquest tower interconnect the sound is amazing for 100 bucks. I have had and have a lot of hi end gear and the quality that you get out of this little guy just blows my mind for the price. I use a Harmon Kardon hk550 receiver and also a Pioneer Elite network receiver for music. I am extremely pleased with the performance I get through the Dragonfly. I use the aux input on the receiver and USB with 3.5mm cable out from my computer just as your note says. I sometime use my iPhone with the dragonfly to go to the aux input of my Pioneer the same way. I think the audio is outstanding. Hope this helps. Sorry for the previous interruptin. The schiit modi and dragonfly are very close in sound without doing very critical a-b testing. Either is a major improvement over the line out from the pc. Has anyone used the Dragonfly Black with noise-cancelling headphones (like the Bose QuietComfort25s)??? I use the Dragonfly Black with AudioTech ATH-ANC9 noise-cancelling headphones. There's not much difference using the Dragonfly with a cheap set of earbuds, but it's a pretty dramatic difference with noise-cancelling headphones. I have used it with the Blue Lola headphones as well as the Munition Pro40 headphones and they sound great. My iPhone through the Dragonfly can power both pairs really well and sound quality is obviously better that the integrated dac. my phone has usb type c, will this work? Nope. You'd need an adapter to get this down to a USB C.
Would this work with an iPod? The device needs to have a port for lightning to USB adapter. I'm not familiar with all iPods, but the iPod touch might. Don't think it works with the older versions. As long as it is a later generation iPod with the Lightning connector, then it will work. I use it with my iPad mini and it is connected by the Apple camera adapter, which I bought at Crutchfield as well. Don't pass up the DragonFly Black. It really makes a difference. Would work great - you'll just need a USB adapter compatible with your ipod. Just Google "Dragonfly ipod usb adapter". 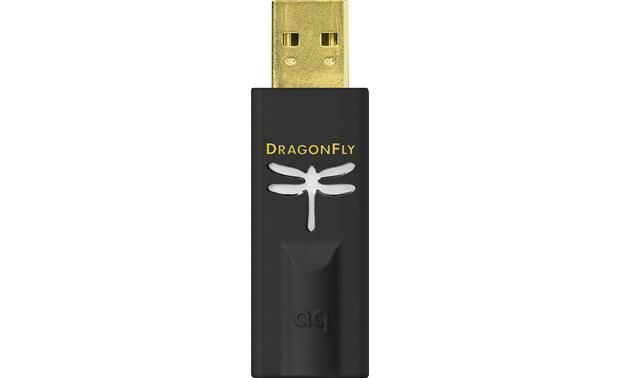 Is the dragonfly black compatible with the Samsung Galaxy Note 3? 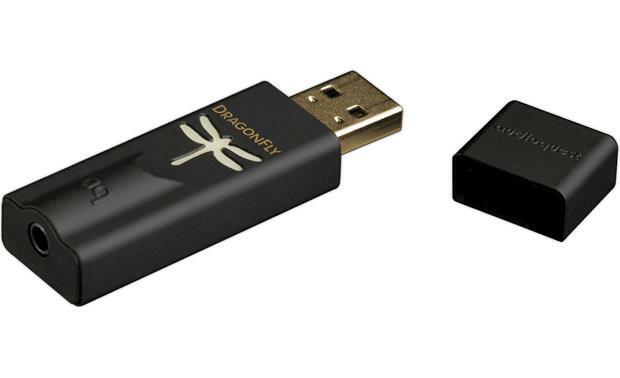 The DragonFly Black v1.5 is compatible with most Android devices running on Lollipop OS (and some Android devices running on KitKat), provided that the device manufacturer has adhered to the USB specification and implementation, and supports audio over USB. To verify that your Android device complies with isochronous USB audio, you can download and run USB Host Check (link: https://play.google.com/store/apps/details?id=org.tauruslabs.usbhostcheck) from the Google Play Store. I hope that helps! I use my iPhone 6 to run audio form Amazon Prime Music to my Onkyo amp with Polk tower speakers. Will this make a noticeable difference? It brings the soundstage to a more immersive front, as well adds depth to every instrument in a given track. While it might not be a night and day experience, a trained ear will appreciate this device. Not too sure about that application but when used with my Hi Fi Man 600 earbuds it was a night and day difference. You can always try it and return it since Crutchfield offers a great return program. Would this work in a vehicle? I use the Dragonfly with the Apple Lightning adaptor in my vehicle. I use a mini to mini cable and plug one end into the aux jack in my car and the other end to the Dragonfly. Works good and I carry it with me all the time. I do extensive driving for work and it's great. Charge your phone if you're using it for music source. You can't charge while hooked up this way. Question is probably beyond my pay grade. It connects to a USB port and then to headphones. I use it with my computer or my iPhone using a lightening to USB connector. Your question is pretty broad but yes it works in a vehicle. I use my iPhone, using a lightning >> USB adapter (the camera adapter), to the Dragonfly, then this goes via 3.5mm (standard headphone size) into the aux in of my truck. 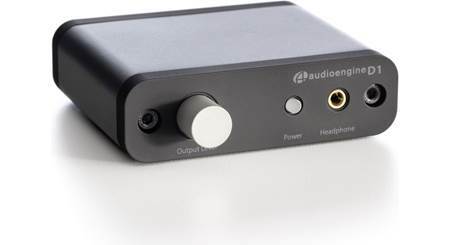 Searches related to the AudioQuest DragonFly® Black v1.5 Plug-in USB DAC/headphone amplifier, compatible with Apple® and Android™ mobile devices.